Rosa María Payá Acevedo... "I also demand" ... "Plebiscite Cuba"
Tania Bruguera, is an internationally recognized installation and performance artist. She is also the daughter of Miguel Bruguera, "a Cuban Political Advisor to the Cuban Embassy in Paris and ambassador to Lebanon and Panama." She is a daughter of the nomenklatura. This may provide some protection for a dissenting voice. Five years ago in April of 2009 she organized a performance art piece that sparked a debate over free speech in Cuba outside of the island and she is at it again. The idea is go to the Plaza the 30th of December at 3pm sharp to talk and peacefully converse about what is worrying us in these moments. To be together letting others know what we think and why, in an atmosphere of tolerance and respect. Let there be diversity of opinions and topics to talk and discuss together. We do not have an agenda or seek a particular ideological line: we just want people to come, come those who so far have not found a place to share their doubts or experiences or do not feel represented by alternative spaces that have already been created. Meanwhile in Miami to draw further attention to this performance art piece being held in Havana a second one is planned to be held outside the Freedom Tower in Downtown Miami.An open microphone where in the same spirit described above individuals can come and speak their minds for one minute. 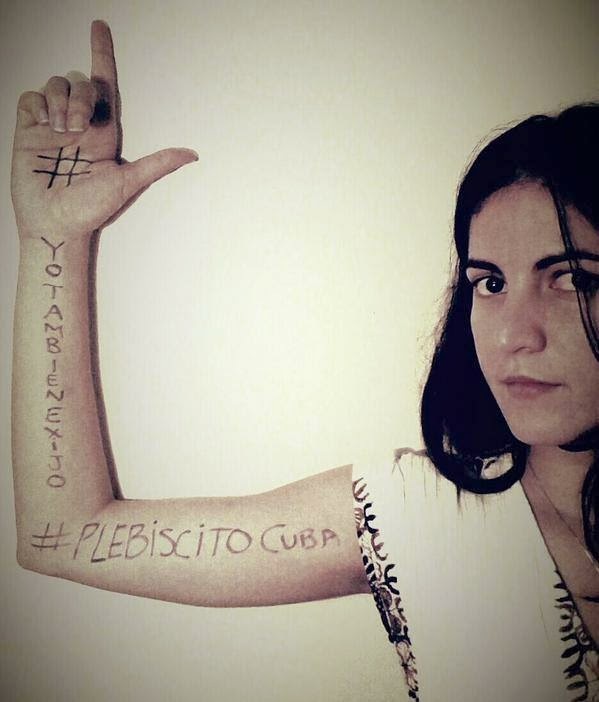 It is being organized by Rosa María Payá Acevedo who has adopted the hashtag #YoTambienExijo (#ITooDemand) and added a second hash tag #PLEBISCITOCUBA (#PlebisciteCuba). On Tuesday, December 30 at 3:00pm keep an eye out for these acts of performance art that are also a test for free speech and the totalitarian security apparatus in Cuba. "Four things have to take place for Cuba to begin the transition to democracy and national reconciliation: 1. Free and internationally supervised free elections need to be held in Cuba after the Constitution is changed so that the Communist Party monopoly is ended and rights are respected. 2. All political prisoners need to be freed. 3. An international and transparent investigation needs to be carried out into the deaths of Oswaldo Payá Sardiñas and Harold Cepero. 4. The individuals in the chain of command that ordered and carried out the shootdown of two Brothers to the Rescue planes on February 24, 1996 and the sinking of the "13 de Marzo" tugboat on July 13, 1994 need to be held accountable before a court of law." Finally, I would recommend that all representatives of organizations who are present consider signing the Democracy Accord. Needless to say that you can say a lot in just one minute when you put your mind to it. "So, with respect to sabotage, I mean, my understanding of the history, for example, of the plane being shot down, it’s not clear that that was the Cuban government purposely trying to undermine overtures by the Clinton administration. It was a tragic circumstance that ended up collapsing talks that had begun to take place. I haven't seen a historical record that suggests that they shot the plane down specifically in order to undermine overtures by the Clinton government." 1) Radio communications between the MiG29 and the military base clearly show that the fighter planes were sent out before the Brothers to the Rescue aircraft arrived at the 24th parallel level, that they were searching for a specific target, and that they even decided not to attempt any warning maneuvers to make the shoot down easier for the Cuban MiG pilots. From the circumstances surrounding the events of 24 February 1996, from the disproportionate and indiscriminate use of lethal force applied to the civilian aircraft, from the intensity of that force, and from the way in which the authorities at the Havana military control tower congratulated the MiG-29 pilots after they had carried out their orders, the Commission finds sufficient evidence that Carlos Costa, Pablo Morales, Mario De La Peña, and Armando Alejandre were arbitrarily or extrajudicially executed at the hands of agents of the Cuban State. Consequently, the Cuban State is responsible for violating the right to life, as enshrined in Article I of the American Declaration of the Rights and Duties of Man. 3) U.S. courts have also found the Castro regime guilty of premeditation in this shoot down. U.S. District Judge James Lawrence King found Cuba guilty in civil court of planning the shoot down before the actual attack, and noted that there had been ample time to issue warnings to the Brothers to the Rescue aircraft if these had been needed. A jury in criminal court presided by U.S. District Judge Joan Lenard found Miami-based Cuban spy Gerardo Hernandez guilty of conspiracy to commit murder because of his role in providing information to the Cuban government on the flight plans of Brothers to the Rescue. On August 21, 2003 a U.S. grand jury indicted the two fighter pilots and their commanding general on murder charges for the 1996 shoot down. 4) A Cuban pilot saw Cuban MiGs rehearsing the shoot down six days before the attack. "MX instructs that under no circumstances should German nor Castor fly with Brothers to the Rescue or another organization on days 24, 25, 26 and 27, coinciding with celebration of Concilio Cubano [a planned national conference of dissident groups in Havana], in order to avoid any incident of provocation that they may carry out and our response to it." Five years ago on Christmas morning in Beijing the nonviolent dissident, scholar and Nobel Peace Prize Laureate Liu Xiaobo was sentenced to 11 years in prison for the crime of speaking. He had already been jailed for more than a year for being one of the authors of Charter 08 that sought to gather signatures in a petition calling on the Chinese regime to gradually shift toward democracy. But I still want to say to this regime, which is depriving me of my freedom, that I stand by the convictions I expressed in my "June Second Hunger Strike Declaration" twenty years ago ‑ I have no enemies and no hatred. None of the police who monitored, arrested, and interrogated me, none of the prosecutors who indicted me, and none of the judges who judged me are my enemies. Although there is no way I can accept your monitoring, arrests, indictments, and verdicts, I respect your professions and your integrity, including those of the two prosecutors, Zhang Rongge and Pan Xueqing, who are now bringing charges against me on behalf of the prosecution. During interrogation on December 3, I could sense your respect and your good faith. This decision to bust up hatred with love combined with the firmness and courage at the same time to reject and defy the injustices committed is not only a core principle of nonviolence but also of the gospel of Jesus Christ. Jesus commands us to love our enemies, and pray for those who persecute us. When one says the Lord's prayer how many understand and internalize that "If you forgive others their transgressions, your heavenly Father will forgive you. But if you do not forgive others, neither will your Father forgive your transgressions." Liu Xiaobo in the statement above is doing just that. Oswaldo Payá was murdered by the Cuban regime's state security agents on July 22, 2014 but he lived the above creed until the end, and the movement, he helped to found, continues to embrace these nonviolent principled. 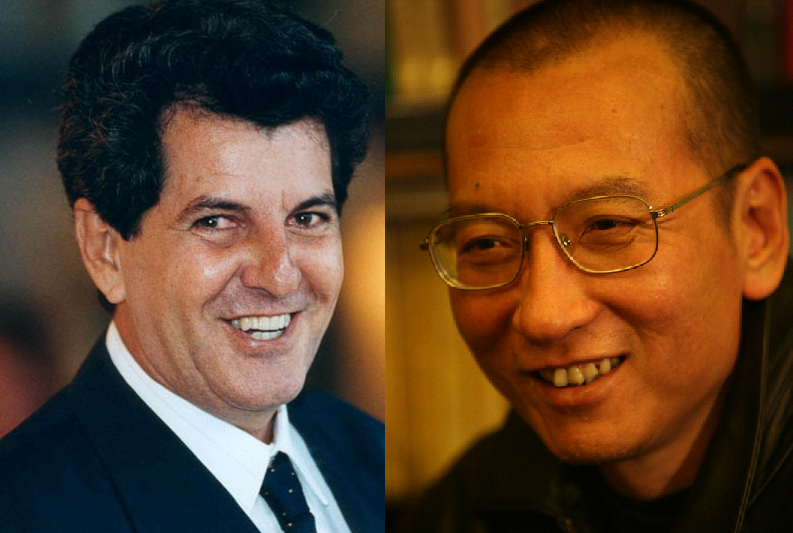 On December 28, 2014 Liu Xiaobo will be observing his 59th birthday and his sixth behind bars in a Chinese prison. He is a prisoner of conscience imprisoned in 2008 for his participation in the drafting of Charter 08. His wife, Liu Xia, has been under house arrest since 2010 when her husband won the Nobel Peace Prize. Norway was threatened by Communist China not to award the 2010 Nobel Peace Prize to Liu Xiaobo but courageously went ahead and did so. Relations between the two countries have not been the same since then. In addition the Chinese regime initiated its own "Peace Prize" in 2010 to counter Nobel's and Fidel Castro is the 2014 winner. Human rights activists in 2014 organized a Christmas card writing campaign in solidarity with imprisoned Chinese dissidents to mark the five years that have passed since the trial of Liu Xiaobo where he was found "guilty" of "incitement to subvert state power." Imagine for a moment that Norway with a population of five million shook up Communist China with a population of over 1.3 billion and the largest economy on the planet with a simple moral and courageous stand by recognizing one Chinese human rights defender who nonviolently advocates for a peaceful transition in China. This demonstrates how small moral actions can have huge consequences, and why sending Christmas cards to imprisoned dissidents is of such great importance. Once again Bendixen & Amandi International are peddling a poll in the media that purports that there is a generational divide in the Cuban exile community over the new U.S. Cuba policy announced by the Obama Administration. Bendixen has been called to account time and time again for having numbers that do not add up but always favor the anti-embargo position. The pollster has gone on record in his advocacy of remittances in Cuba showing that he has a dog in this race. Another outfit with a dubious record are the Cuba polls conducted by Florida International University (FIU) that have been sponsored by the Brookings Institution, the Cuba Study Group, the Christopher Reynolds Foundation and the Ford Foundation. All of these groups lobby heavily in favor of unconditionally lifting the U.S. embargo on the Castro dictatorship. In 2014 the FIU poll was paid for by The Trimpa Group and George Soros' Open Society Foundation. In an interview on Saturday a journalist asked my thoughts on the latest Bendixen poll trying to sell the idea that there is a generational divide and that the youth are against maintaining sanctions on Cuba. The response to the question: Stated clearly that their polls have a bias and therefore don't pay them any attention. Journalists should consider questioning pollsters and not accepting at face value what they are peddling. Here is the reason why. Bendixen back in 2008 said Lincoln Diaz-Balart was supposedly statistically tied with Raul Martinez, 41 to 37 percent in July. On October 23, 2008 The Miami New Times wrote a lengthy article by Francisco Alvarado titled: "End of the Diaz-Balart Dynasty: The Republican brothers are headed for defeat, and Cuban-American politics will change forever." 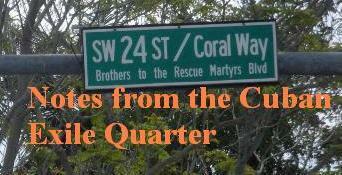 Letters to the editor followed up reaffirming the previous weeks article on the political demise of the Diaz-Balart brothers and then election day and both were re-elected. On election day: Lincoln Diaz Balart won with 57.90% to Raul Martinez's 42.10%. Martinez had campaigned about loosening the embargo not ending it. There has yet to be a Cuban American congressman or Senator that has been elected anywhere who is against maintaining the Embargo. This position transcends party allegiance and ideology. The bottom line a polling outfit can get whatever response they want depending on the wording of their questions, but the fact remains that on election day in precincts where the overwhelming numbers are Cuban Americans they strongly vote for pro-Embargo candidates. One fundamental question comes to mind in all this "news" about polls supporting the president's actions on Cuba: Why did he wait until after the 2014 mid term election to act? With a Democratic Senate, President Obama could nominate the new US ambassador to Cuba, but now with a Republican Senate in 2015 that nomination can be blocked. What this says is that despite all the hype and bogus push polls when it came to the only poll that counts, the vote on Election Day they blinked. Meanwhile the arguments of the current Obama policy continue to flow in from all quarters and are worth checking out: The Washington Post's Jackson Diehl, andThe Wall Street Journal's Mary O'Grady should be read. President Barack Obama's claim on December 17, 2014 that he was making "the most significant changes in our policy in more than fifty years" is patently untrue when he says that they would begin the normalization of relations with the Castro regime. 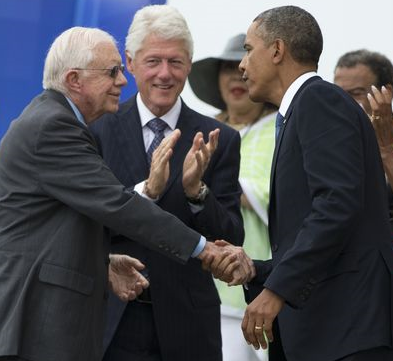 The two men who have achieved the most significant changes on Cuba policy to date are Jimmy Carter and Bill Clinton. 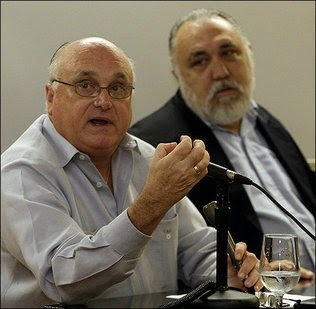 President Obama still has a way to go in terms of policy but has achieved one significant and shameful change: swapped three of the Castro regime's terrorist spies (one of which was convicted of conspiracy to commit murder of four Americans) for Alan Gross, an innocent man who should have never been arbitrarily detained for five years in a Cuban prison. On March 19, 1977 President Jimmy Carter allowed the US travel restrictions to lapse. Six months later on September 1, 1977 Carter opened the U.S. Interests Section in Havana where the old U.S. Embassy had been and the Castro regime opens an Interests Section in Washington, DC. If Jimmy Carter had been re-elected President in 1980 he would have completed normalizing relations with the Castro regime. American voters decided differently and elected President Ronald Reagan in 1980 who on April 19, 1982 re-established the travel ban and tightened trade sanctions against Castro regime. Restoring full diplomatic relations would entail changing stationary, business cards and appointing an Ambassador in practical terms. Jimmy Carter did all the heavy lifting 37 years ago. None of this changed the behavior of the Castro regime which succeeded in overthrowing the Somoza regime in Nicaragua and installing the Sandinista regime, a Marxist dictatorship while at the same time assisting in a genocide in Ethiopia. 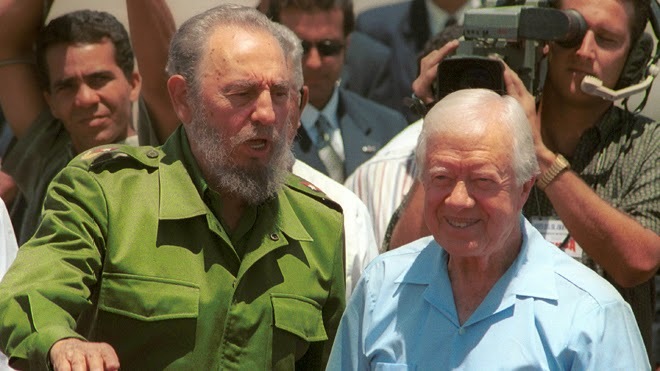 Twenty five years later Jimmy Carter was the first president to visit Fidel Castro in Cuba. 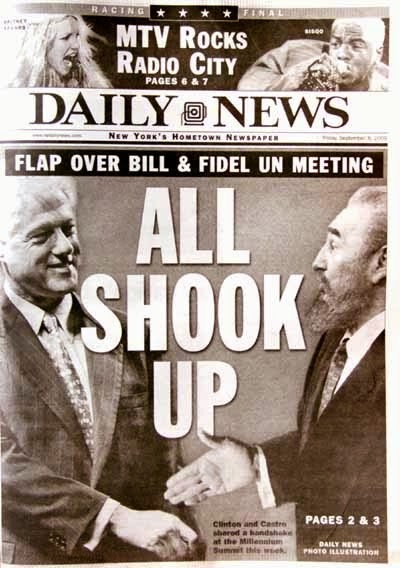 Bill Clinton shook hands with Fidel Castro in September of 2000 and a month later signed the Trade Sanctions Reform and Export Enhancement Act and opened cash and carry trade with the Castro dictatorship at the end of his Administration. At the time of its passage, Fidel Castro said "his country would not buy 'even a grain of rice' under the current terms." The Cuban dictator ended up buying much more than a grain of rice under those terms. Between 2000 and 2013 American companies have sold $4.689 billion dollars in goods to the Castro regime on a cash and carry basis. On Clinton's watch the Castro regime shot down two civilian planes in international airspace in a premeditated and calculated conspiracy that allegedly included members of the Clinton Administration and the Cuban Wasp spy net work that would be broken up on September 12, 1998 when it was discovered that they had planned acts of sabotage and terrorism on American soil, including the murder of an alleged CIA agent living in Bal Harbour Florida. During the Clinton Administration a threat assessment was prepared by the Department of Defense that reported Cuba was no longer a threat to the national interests of the United States, but in 2001 it was discovered that the main author of the report, Ana Belen Montes, was a long time agent of the Castro regime. Fulton Armstrong, a harsh critic of U.S. pro-democracy programs suspected of leaking information to the Associated Press was a close confidante of Castro's spy at the Pentagon. Despite the 2003 crackdown on dissidents known as the Black Cuban Spring where the Bush Administration tightened sanctions on being able to travel to Cuba and set limits lower on remittances sent to the island. However, nothing was changed in the cash and carry sales made by U.S. companies to the Castro regime.Towards the end of the Bush Administration in August of 2008 the Cuban government announced that the United States was its fifth leading trading partner. Despite the rhetoric the joint military exercises continued through out the eight years of the Bush Administration, and not surprisingly have continued under the Obama Administration. 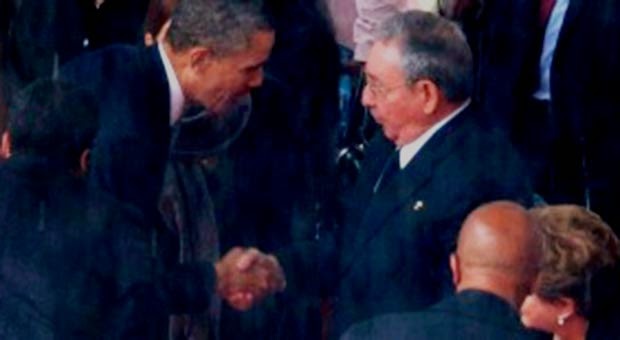 In 2009 President Barack Obama loosened embargo restrictions and four years later shook hands with Raul Castro at Mandela's funeral in South Africa on December 10, 2013 while human rights defenders in Cuba were being beaten up and arbitrarily detained on International Human Rights day. 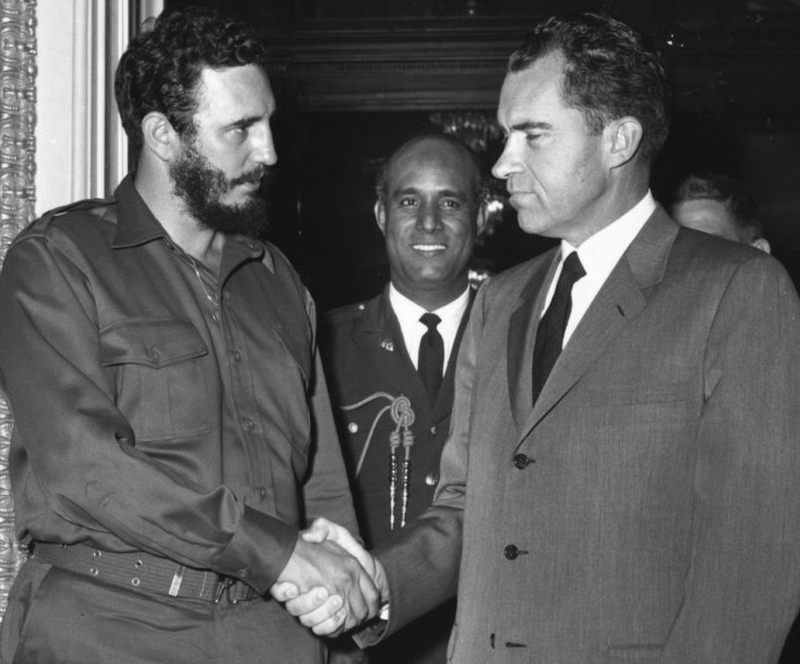 Ironically, the first U.S. president to shake hands with Fidel Castro was Richard Nixon on April 5, 1959 when he was President Eisenhower's Vice President. Nixon met with Fidel Castro for two and a half hours in what was supposed to be a 15 minute meeting. Fidel Castro described the meeting as "very friendly." Ironic because after Richard Nixon's resignation in 1974 to avoid impeachment in the Watergate scandal it was his Secretary of State Henry Kissinger who made a serious attempt to normalize relations with the Castro regime during the Ford Administration. At the time Secretary Kissinger was engaged in diplomatic outreach in 1975 with the Khmer Rouge who he himself recognized were murderous thugs he was also advocating lifting the embargo on Cuba and normalizing relations with Fidel Castro. 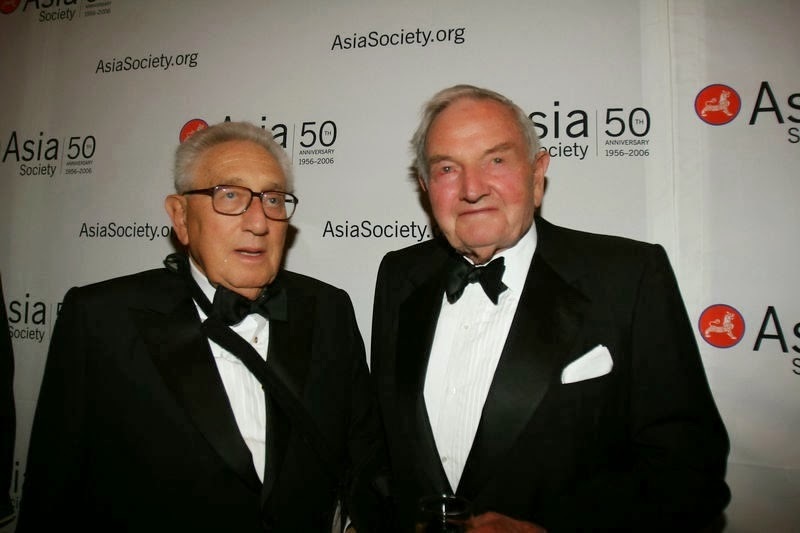 Kissinger has also had a close relationship with David Rockefeller, a man who always opposed sanctions on Fidel Castro and hosted the Cuban tyrant at a dinner at the Rockefeller family's Westchester County, N.Y., estate in 1995. President Barack Obama's new Cuba policy is neither brave nor the "most significant" in the past half century but part of the Establishment's long game to normalize relations with the Castro regime that stretches back at least 39 years. This is the third of three reflections (The New Cuba Policy: How did we get here?) in a multifactorial analysis of what is taking place on Cuba policy today. The first part looked at the state of the United States in 2014 and why it would be susceptible to the machinations of the campaign underway. The second part provided an overview of totalitarian networks and why democracies have difficulty defending themselves from them. The Castro regime is a totalitarian communist dictatorship that has ruled over Cuba since 1959. Only a few states today can be described as totalitarian communist dictatorships and the others remaining as far as I know are North Korea, Vietnam and China. Although a number of countries are trending that way now in Latin America with Venezuela leading the way. This is what is meant when one defines the dictatorship in Cuba as totalitarian. 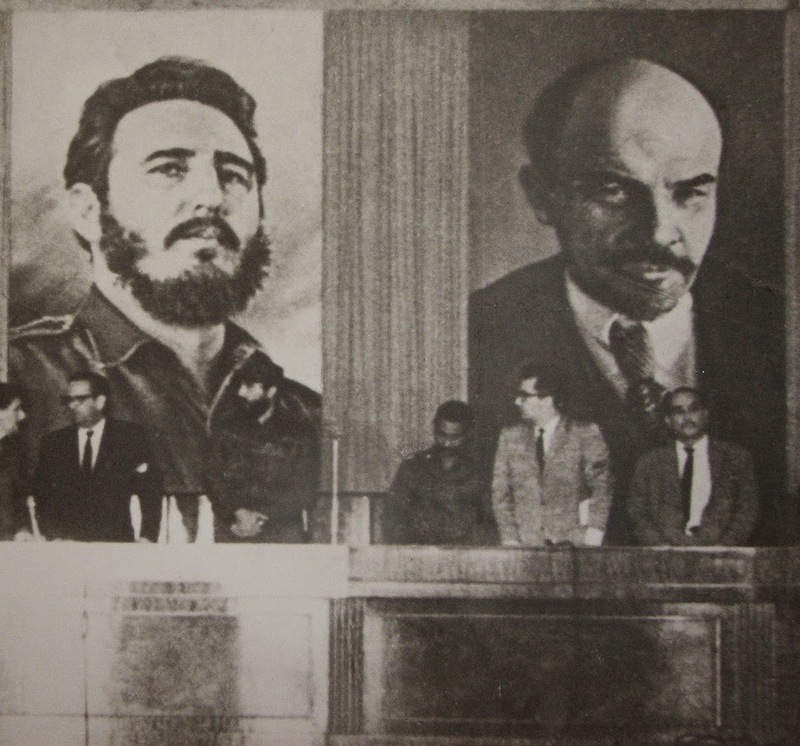 Under the Castro regime only one political party is legally recognized in the Cuban constitution, the Communist party. Private schools were closed in Cuba in the 1960s and all is controlled by the dictatorship and students who dissent, such as gather signatures for a legal citizen initiative like the Varela Project are expelled. There are no legally recognized independent non-governmental organizations in Cuba. The economy remains under control of the Castro regime. Any foreign investors must enter into partnerships with the dictatorship. Workers salaries are paid by foreign investors to a regime agency that in turn pays Cuban workers in the local and devalued currency. Employers who have tried to pay workers directly under the table have been arrested and jailed. Critical thought can fall under the categories of oral or written enemy propaganda and is punishable by prison. Also associating with persons with these ideas opens one up to a charge of "predilection to social dangerousness" and can also be imprisoned. International Communism reached a historic low point between 1989 and 1991 that began with the liberation of Eastern Europe and ended with the relatively nonviolent dissolution of the Soviet Union on Christmas day in 1991, but that was not the end of communism. The hard left in the midst of this debacle regrouped in 1990 and began to meet and plan in the São Paulo Forum. The Castro regime was and remains a member of this network. This now brings us to the second important question: What is a network in political science? Networks come in various guises. Transnational, regional or global networks and movements are political mechanisms of social organization. These networks are not hierarchical, with a low level of institutionalization and lacking a developed bureaucracy have a decentralized organizational structure. They are organizational forms in which there is a horizontal flow of information and decisions are taken in a connective web between equals. Although characterized by their "creativity", "horizontality" and "solidarity" which, in structural terms, involve the ability to adapt and facilitate participation, are neutral as to its purpose. They can be democratic or totalitarian. Lenin created the Communist International, KOMINTERN in 1919 as a means to disseminate the Soviet revolution and consolidate dominance of Marxism-Leninism over the global Left. The dictator proposed to join together the radicals of the world under a great network of Communist parties under the control of the Soviet Revolution. This was the instrument that Münzenberg used to organize cultural power. The first congress of the Communist International was held on March 2, 1919 and included delegates from communist or socialist parties from Russia, Germany, Austria, Hungary, Poland, Finland, Ukraine, Latvia, Lithuania, Belarus, Estonia, Armenia, France, Switzerland, China, Korea, Bulgaria, Switzerland, Sweden, the United States, Azerbaijan, Yugoslavia, and the Netherlands among other countries. Beginning in 1921 Lenin seized Münzenberg as the director of clandestine operations of propaganda aimed at the West. 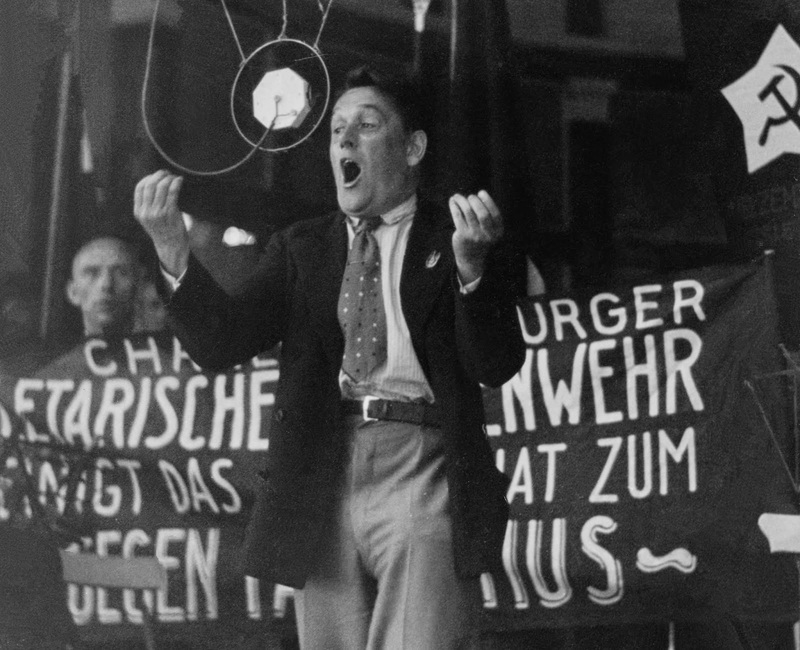 To create networks of supporters Münzenberg used all the resources propaganda from high culture to the most basic. He organized the media: film, radio, theater, books, magazines, and newspapers. He was able to connect to and use all types of formers of opinion respected by the public: writers, artists, actors, priests, ministers, teachers, businessmen, scientists, and psychologists. The Münzenberg network was one of the key factors for the direction taken by the political attitudes that operated in the 1930s. He manipulated and influenced popular public opinion using this network writers and intellectuals such as: Ernest Hemingway, John Dos Passos, Lillian Hellman, George Grosz, Erwin Piscator, André Malraux, André Gide, Bertolt Brecht, Dorothy Parker to Kim Philby, Guy Burgess and Anthony Blunt. His objective at the international level was to create the belief that the foreign policy of the Soviet Union was developed from the essential elements of human decency. That is to make it politically incorrect to criticize Soviet foreign policy. He organized protest marches, politicized writers conferences, politicized art festivals, ad hoc committees signed by famous celebrities for causes without end. The effectiveness of the strategies and tactics of Münzenberg to mold progressive public opinion was and still remains effective. The string of articles advancing the talking points of the Castro regime in The New York Times and the Associated Press follow this long tradition. 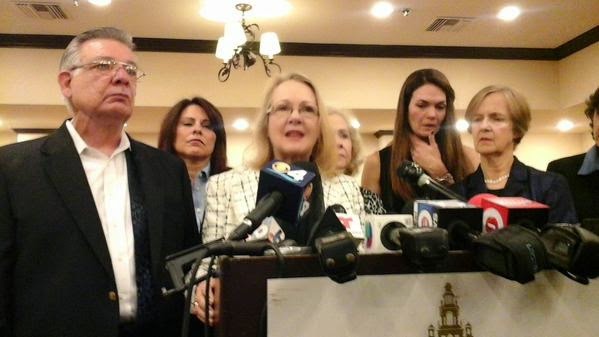 What we are witnessing today with the Castro regime is the successful outcome of one of two Münzenberg type campaigns: 1) freeing the five Cuban spies arrested in 1998 for acts of espionage, sabotage, and terrorism. 2) the campaign to end the United States embargo on Cuba. Following the February 24, 1996 Brothers to the Rescue shoot down which at the time was considered an act of war “the Embargo" was codified into law by the Helms-Burton Bill placing control over sanctions policy in the Congress and out of the Executive the alternative at the time being debated was a military response against the Castro regime. Nevertheless, President Clinton issued waivers on key provision of the new law that have continue to been waived until the present day. However, once the crisis passed President Bill Clinton shook hands with Fidel Castro in September of 2000 and a month later signed the Trade Sanctions Reform and Export Enhancement Act and opened cash and carry trade with the Castro dictatorship at the end of his Administration. At the time of its passage, Fidel Castro said "his country would not buy 'even a grain of rice' under the current terms." The Cuban dictator ended up buying much more than a grain of rice under those terms. Between 2000 and 2013 American companies have sold $4.689 billion dollars in goods to the Castro regime on a cash and carry basis. Despite the 2003 crackdown on dissidents known as the Black Cuban Spring where the Bush Administration tightened sanctions on being able to travel to Cuba and set limits lower on remittances sent to the island. However, nothing was changed in the cash and carry sales made by U.S. companies to the Castro regime.Towards the end of the Bush Administration in August of 2008 the Cuban government announced that the United States was its fifth leading trading partner. "[S]ince March 2009, a select group of commercial banks now will be able to offer terms of 180 days to five years on federally-guaranteed loans to the foreign buyers of U.S. exports without having to obtain prior federal approval. ... Because of the foreign risks involved in export lending, most commercial banks through-out the world do not make these loans without government guarantees. In the U.S., the guarantees are provided by the Export-Import Bank of the United States (Ex-Im Bank), a federal agency. 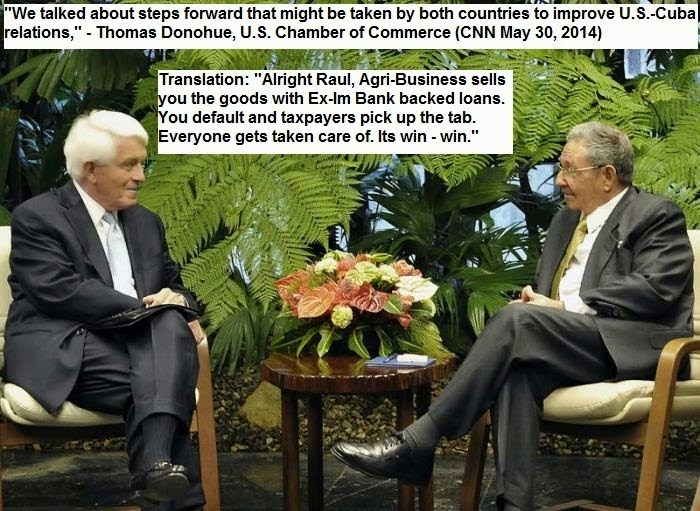 The gullible will believe the Castro regime's claims that the billions in goods purchased from the United States is just the tip of the iceberg for trade opportunities once the embargo is lifted. The reality is that what is taking place is the ultimate variation of the bait and switch con. A policy of normalization with the current government in Cuba may be good for Agro-business, the US Chamber of Commerce, and the Castro regime but it will not be good for American taxpayers who will be left holding the bag like so many other tax payers around the world. Another trend that is reinforcing the power of the totalitarian networks is the impact of donors on the research agendas of think tanks and priorities of human rights organizations have been shifted to advocate for abortion and gay rights as in the case of Amnesty International and Human Rights Watch. The network of deep pocket supporters pushing for the lifting of sanctions goes back decades and includes: David Rockefeller and his Council on Foreign Relations, George Soros and his Open Society Foundation, the U.S. Chamber of Commerce, The Carlyle Group, Archer-Daniels-Midland, Cargill, The Brookings Institute, The Arca Foundation, Kissinger and Associates, The Ford Foundation, and the Center for Democracy in the Americas. It wasn't President Obama who convinced big business, human rights groups, lawmakers, and some Cubans to go along with the policy shift. Some do sincerely believe that lifting sanctions can spur change, but many others have been swept up in effective campaigns run through extensive and sophisticated totalitarian networks that have a long history in shaping public opinion. Billions of dollars in hard currency purchases by the Castro regime from U.S. agribusiness since 2000 has generated a powerful lobby combined with corporate greed that provides the perfect storm unfolding today. This is a long game that goes back decades and involves a strategic vision. Obama didn't convince anyone of anything. The president is just doing what he is told. This is the second of three reflections (The New Cuba Policy: How did we get here?) in a multifactorial analysis of what is taking place on Cuba policy today. The first part looked at the state of the United States in 2014 and why it would be susceptible to the machinations of the campaign underway. The third part refutes the claim that Obama has made the biggest changes in a half century on Cuba policy looking at the steps taken by Carter and Clinton. 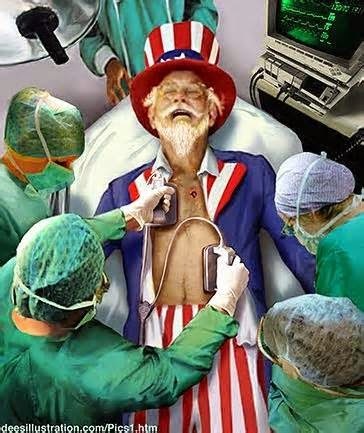 What ails America? A bad case of ethical relativism. This blog entry seeks to begin to answer the question above which is based on some assertions raised in a Politico article titled "Obama’s heavy lift on Cuba." The short answer to Pam's question is "no, he didn't convince them," and the previously mentioned article is a misrepresentation of what is taking place. Below is a longer explanation of how we have reached the present moment, and it does not begin with President Obama. "I warned of the "risk of an alliance between democracy and ethical relativism, which would remove any sure moral reference point from political and social life, and on a deeper level make the acknowledgement of truth impossible" (No. 101). In fact, as I noted in another Encyclical Letter, Centesimus Annus, if there exists no ultimate truth to guide and direct political life "ideas and convictions can easily be manipulated for reasons of power. As history demonstrates, a democracy without values easily turns into open or thinly disguised totalitarianism" (No. 46)." 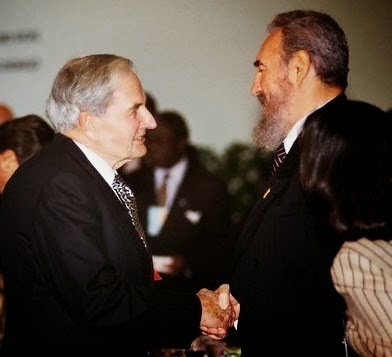 For example the Organization of American States (OAS) has a democratic charter that should bar a Stalinist dictatorship such as Cuba from participating, but in 2009 the relativism and democracy were joined together in a way Pope John Paul II, perhaps had not envisioned, Cuba was welcomed to come back into the OAS and either the Charter was violated or the definition of democracy was manipulated in the service of a political agenda. Nevertheless, the Castro regime refused to join the OAS. The Summit of the Americas original democratic ideals are being violated in order to include Raul Castro, a communist totalitarian dictator as a co-equal participant at the hemispheric gathering who has confirmed that he will be attending. Canada that has a much better record than the United States on human rights has dropped its principled opposition to Cuba participating at the 2015 Summit of the Americas on December 17, 2014. In terms of language hasn't the United States already arrived there with political correctness that is nothing more than cultural Marxism? The unilateral actions taken in lifting sections of the Cuba embargo are in line with trends that predate the Obama Administration. The centralization of power into the hands of the President granted by Congress over the years has reached a level never imagined by the drafters of the Constitution. Furthermore, the degree to which hundreds of millions of United States citizens have their phone calls, e-mails, and travel monitored, recorded and archived for the review of government officials reads like something out of Orwell's dystopian novel 1984 not The Federalist Papers. Individual rights and liberties have been eroded not only by the President but accompanied by actions of both the Congress and the courts. Finally the president has been granted the power by congress to indefinitely detain, and if necessary extrajudicially execute anyone he thinks is a potential threat to the United States, including citizens. Within the White House the Obama Administration unilaterally generates kill lists. Torture is being defended as a legitimate practice despite Ronald Reagan having signed the Convention Against Torture making it illegal in the United States. The United States is not number one: in press freedom (46th), private property rights (17th), and its overall human rights rank is (19th) prosperity (10th) and its national economy has been eclipsed by China making it second place. The United States is more than 18 trillion dollars in debt and climbing. An interesting comparison is that in terms of public debt the United States places as 35th most indebted country in the world with Zimbabwe in first place but Sweden is down at 85th with a more responsible fiscal policy. The situation of the United States is so dire that on Amazon there is a book on how to come to terms with the end of America by Aaron Clarey titled "Enjoy the Decline: Accepting and Living with the Death of the United States." Incidentally, over the past twenty years China has expanded its influence throughout the Western Hemisphere. The ironic part is that the expansion first began in the United States, with its policy of engaging Communist China. It had no moral authority to call on Latin American countries to do any different. According to The Economist the steady decline in human rights internationally over the past eight years is linked to an ascendant communist China. The United States normalized relations and engaged in trade with both China and Vietnam making both countries richer but the political rights of their citizens in both countries have been in decline over the past decade. Equally disturbing are that the torture practices mentioned above were copied from the Chinese communists. Engagement has not only failed to lift human rights standards in China and Vietnam but helped to degrade them in the United States. In Burma where a multilateral sanctions policy succeeded in pressuring the military regime to free Aung San Suu Kyi in 2010 and allow her to run for parliament in 2012 the sanctions have been lifted and real reforms have now stalled. Suu Kyi had warned at the time of her election in May 2012 that it would be premature to lift sanctions, but by September 2012 she was advocating lifting them. In May 2013, President Obama said the U.S. goal in keeping some sanctions, while gradually eliminating others, is "to ensure that the democratic transition becomes irreversible." The United States went ahead and lifted additional sanctions in 2013 following a first round of loosening them in 2011. The European Union permanently lifted its sanctions on the Burmese military junta also in 2013. The Obama Administration had chalked Burma up as a success but is now scrambling with a deteriorating human rights situation there. This is eerily similar to ongoing action in Cuba but with the difference that military junta released political prisoners and recognized the political opposition's electoral victories prior to Obama lifting most sanctions. This is the first of three reflections (The New Cuba Policy: How did we get here?) in a multifactorial analysis of what is taking place on Cuba policy today. The second part provided an overview of totalitarian networks and why democracies have difficulty defending themselves from them. The third part refutes the claim that Obama has made the biggest changes in a half century on Cuba policy looking at the steps taken by Carter and Clinton. 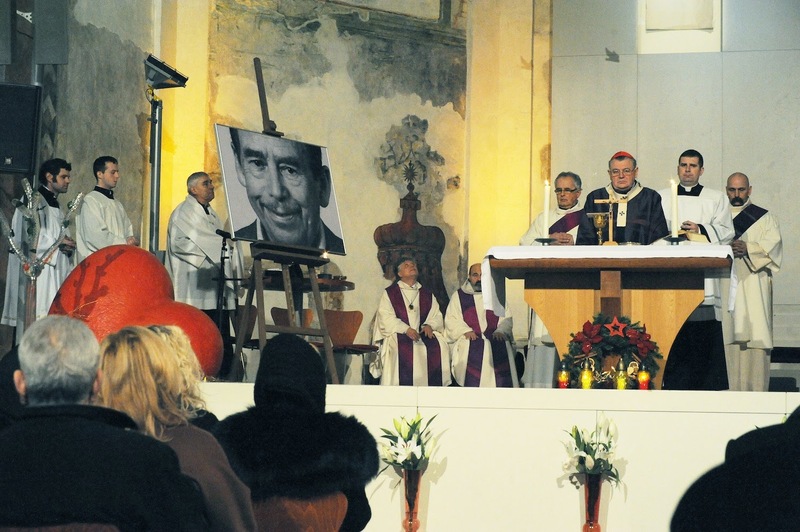 Three years ago today Václav Havel passed away and today he remains greatly missed. In large part, sadly, this is due to the lack of anyone else on the international scene with his moral stature and consistent solidarity with the victims of repression world wide. For example, ten days prior to his passing Havel signed on as one of the members of a new International Committee to Support Liu Xiaobo, the imprisoned Chinese dissident and 2010 Nobel Peace Prize laureate. Yesterday, watching the spectacle of the Obama Administration orchestrating the unveiling of its change in Cuba policy while trying to obfuscate that it had been blackmailed by the Castro regime into releasing a man convicted of conspiracy to commit murder in the February 24, 1996 Brothers to the Rescue shoot down in order to obtain the freedom of Alan Gross, an innocent man brought to mind an observation made back in 2009 by the late Czech president. Havel believed that moral actions, no matter how small or futile they may appear at the time can have profound consequences for both freedom and a just society. It is because the world is not a puzzle to be solved but incredibly much more complex that decisions of right and wrong made by each person have such great weight. Unfortunately, the failure of American diplomats, to reach Alan Gross for 25 days following his kidnapping by the Castro regime in December 2009 sent a signal to the dictatorship that they could do what they wanted with this man. Over the next five years they used him as a bargaining chip demanding the release of Cuban spies who had engaged in espionage, planned to carry out terrorist acts and were implicated in the murder of American citizens.Yesterday the hardliners in the regime achieved their objective. Unfortunately, the consequences for Cuba and the Americas with these moral compromises by the Obama Administration will be "big and dangerous ones" generating new problems and challenges. Make no mistake the message to enemies of the United States yesterday was crysstal clear: Take an American hostage and hang on to him for years until your demands are met and you'll get what you want. It sets a terrible and dangerous precedent. Our world, as a whole, is not in the best of shape and the direction it is headed in may well be quite ambivalent. But this does not mean that we are permitted to give up on free and cultivated thinking and to replace it with a set of utopian clichés. That would not make the world a better place, it would only make it worse. On the contrary, it means that we must do more for our own freedom, and that of others.